A seven-tonne whale has made its way up the Thames to central London, where it is being watched by riverside crowds. The 16-18ft (5m) northern bottle-nosed whale, which is usually found in deep sea waters, has been seen as far upstream as Chelsea. A rescue boat has been sent to protect the whale and rescuers have been trying to keep it away from the river banks. Specialist equipment, including inflatable tubes to re-direct the animal downstream, are being sent. The whale has come within yards of the banks and has crashed into an empty boat causing slight bleeding. Vets are remaining on standby and experts have said it does not appear to be ill, but are concerned it will get weaker and may become beached. Tony Woodley, of the British Divers Marine Life Rescue, which will be handling the rescue, said the animal's welfare was the main priority. He said if attempts to re-direct the whale downstream failed, it might be necessary to put it down to prevent from suffering further. The RNLI say it is the first whale rescue on the Thames. A spokesman said three whales were spotted east of the Thames Barrier on Thursday but only one managed to get upstream. 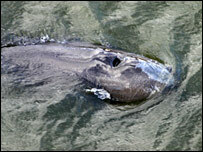 Alison Shaw of the Marine and Freshwater Conservation Programme at London Zoo, said the northern bottle-nosed whale was usually found in groups of three to 10. She told the BBC News website: "This is extremely rare in British waters as they are normally found in deep waters in the North Atlantic. "It is about 16-18ft long, so is relatively mature. It is a very long way from home and we don't know why it has ended up here." The whales usually weigh about seven tonnes, which will complicate any rescue attempt, experts said. London Aquarium Curator Paul Hale told the BBC: "Getting that to do anything it doesn't want to do is going to be extremely difficult. "This is a very active swimming animal and it's not going to go anywhere it doesn't want to go so we have to persuade it to swim back out." Liz Sandeman, a medic of the Marine Connection, a whale and dolphin protection charity, accompanied the RNLI to examine the animal. She feared it might be in danger from other boats, or be frightened by the noise. "The last thing we want to do is stress the animal out," she said. Over the years dolphins and seals have been spotted in the Thames. Sperm whales have been seen in the Thames Estuary and porpoises have feasted on fish near Vauxhall Bridge, in central London.